After testing lots of different caramel corn, I worked and worked (and ate and ate), until I settled on this one. 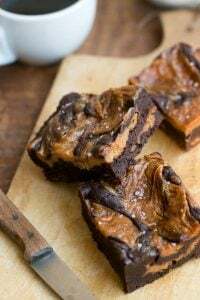 It’s going to featured in an upcoming book but I wanted to share the recipe with you now, because I like it so much and it was too good to keep for myself. 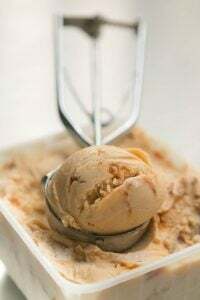 I couldn’t resist using it as a garnish on a bowl of ice cream, but if you’re anything like me, you’ll probably dive into it – just as it is! 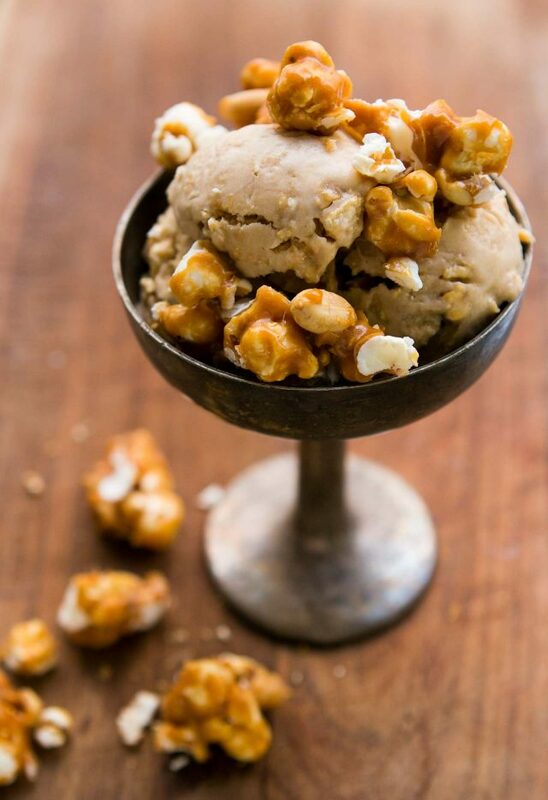 This recipe will be featured in the next edition of The Perfect Scoop, to be released in Spring of 2018.The technique for popping the perfect popcorn is adapted from Simply Recipes. 1 cup (140g) salted peanuts, or use any toasted nuts, such as almonds, pecans, or cashews. Heat oil with 3 kernels in a large, heavy-duty saucepan over moderate heat until they pop. Add the remaining kernels, turn off heat and cover, and let sit 30 seconds. Turn the heat back on and cook with the lid slightly agar (to let steam escape), shaking pan frequently, until kernels stop popping, about 3 minutes. 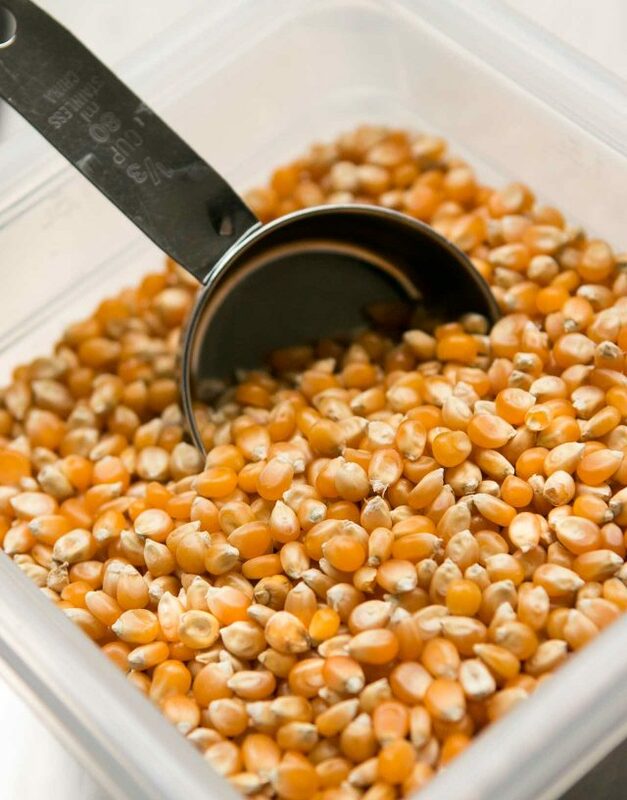 Remove from heat and transfer the popcorn into a very large bowl. You'll get 8 to 10 cups of popcorn. Add the peanuts. Spray a baking sheet with non-stick spray or oil it lightly. Preheat the oven to 200ºF (93ºC). Wipe the saucepan clean and melt the butter in it. Add the brown sugar, corn syrup, and molasses and bring to a boil. Boil for 5 minutes, stirring once or twice, only as necessary to incorporate the ingredients. Avoid overstirring. 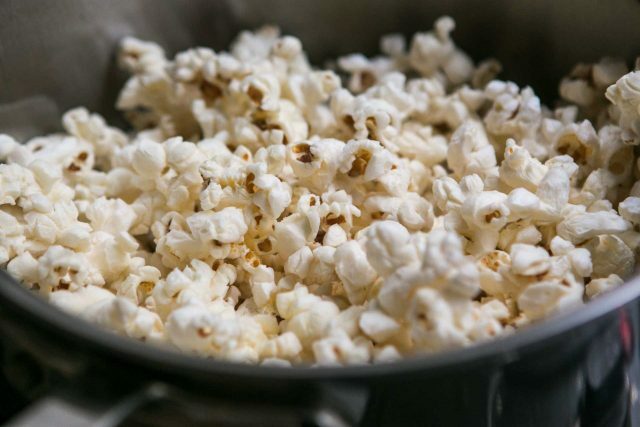 Remove from heat, and using a wooden spoon or a heatproof spatula, stir in the salt, vanilla and baking soda, then pour over the popcorn and stir to coat the popcorn evenly. (Be careful because the outside of the bowl can get hot.) 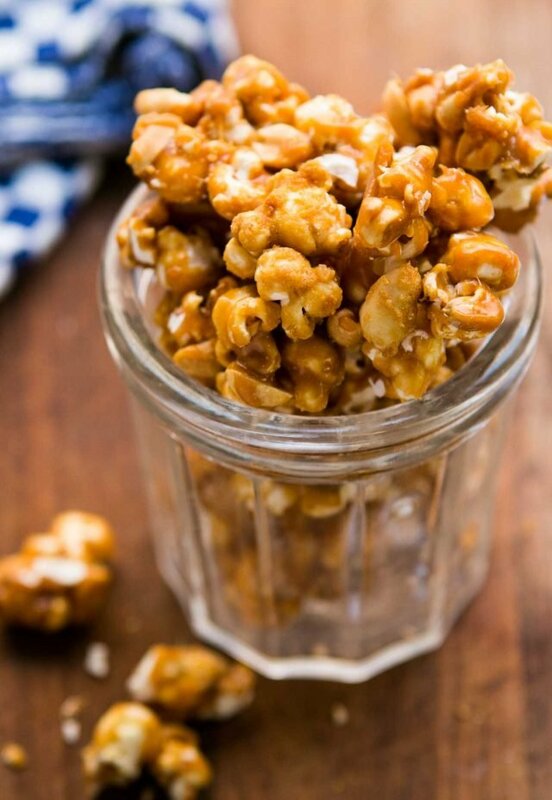 Spread the coated popcorn and peanuts on the baking sheet and bake for 1 hour, stirring every 15 minutes. Let cool completely, then break into bits. Click here for more cookie and candy Recipes. I giggled/am still giggling/ through this entire post! It is cruel to be laughing at your pain, I know, so let’s say….I’m laughing with you?! I too have a popcorn thing – your final product sounds great. Whenever I see Newman’s Own, Microwave popcorn in the stores I buy it. The torture of doing the popping on the stove-top proved to be too much. Cleaning up & recovery should never take longer than the cooking and eating combined, don’t you think? 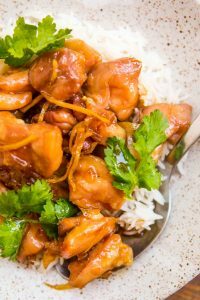 Great take on a classic recipe! I may have to try this! I am coming to Paris in November, I bring you some bags of popcorn for a chocolate tour! By the way, I bought your cookbook “Room for Desseet” last week. Very nice! I have a similar recipe that does not require a thermometer, you just cook the syrup and stuff ‘for a while”. Works for me- I mean, really, when was the last time I saw that thermometer? Oh- you’re right about French dentists- want details? And another thing- got a summer pudding at the downtown bakery today and it was/is soooooo tasty, but Ozzie said his passion fruit bavarian tasted like spit. Any comments? Jess-Yes, you don’t really need to use a thermometer, but when writing a recipe, if you say “cook over medium heat for 8 minutes”, sometimes my idea of ‘medium’ isn’t someone else’s and using a thermometer ensures results (but I give a cooking time just in case someone doesn’t want to bother listening to me, which I know seems hard to believe, but it’s true.) It seems most people have a candy thermometer crammed in the back of their drawer of rarely-used kitchen tools, along with the melon-baller. I would indeed question the use of spit in desserts. Once again, like using a thermometer, I like to ensure accurate results with readers of my cookbooks and it’s impossible to say that my notion of spit would be the same as someone elses. PS: There’s a great, and very easy, recipe for Summer Pudding in my cookbook Room For Dessert….glad you’re enjoying your copy, Richard! David, if I didn’t get excited by your original post, it’s because I have learned through sad experience that most of the “American” stuff sold over here is not as good (or at least the same) as the brands we have in the US. Like Alisa, I hold out for Newman’s or good old Orville Redenbocker. Also, over time I’ve gotten used to the taste of it made with sunflower oil instead of corn oil but again, it’s JUST NOT THE SAME. Still, I don’t turn it into as much of an adventure as you! I must say, the best gift I ever got here in Italy is my hot air popcorn popper! I only use it once or twice a year.. but saves my shoulder. I will find my popcorn recipe for you..Love it!